At this point, the beginner should become aware that backgammon is a game of luck and skill. No modern Computer can figure the percentage of luck against skill in most gambling games. It is no different in backgammon. There is no question that a beginner will clip the ears off the pro if he rolls the proper dice. 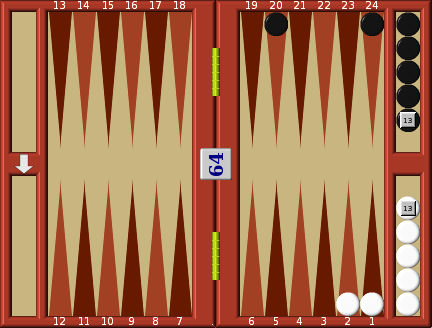 It is also true that at a crucial point of a backgammon game, one perfect roll can change the entire game. This adds to the excitement and unpredictability of the game. One can safely say that if two players of equal skill are engaged in a game, the one with the best dice will win. Likewise, of two players with equal luck, the one with the most skill will win. Since luck does play such an important part in the game, the beginner should become aware of the odds. "Odds" is defined as being the ratio of probability that something is so, will occur, or is more likely to occur than something eise. In other words, in the course of a game you might find that double sixes are just what you need in order to execute your strategy. Keep in mind that the odds against rolling double sixes are thirty-five to one, definitely not much to bank on. As far as odds are concerned, remember that rules are often made to be broken. The odds will serve you well at times; however, at other times, when you have learned how your Opponent plays, they may well be dispensed with. 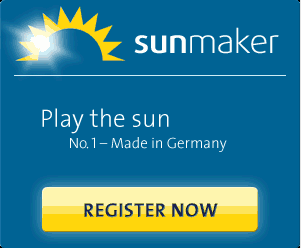 This is true in backgammon as it is in bridge. Often conventional methods of play are changed upon confronting a special Situation. The list of odds below should be kept in the back of your mind. But do not use them with any other dice game; they will not work. Here are the odds against rolling desired numbers or combinations of numbers on dice. 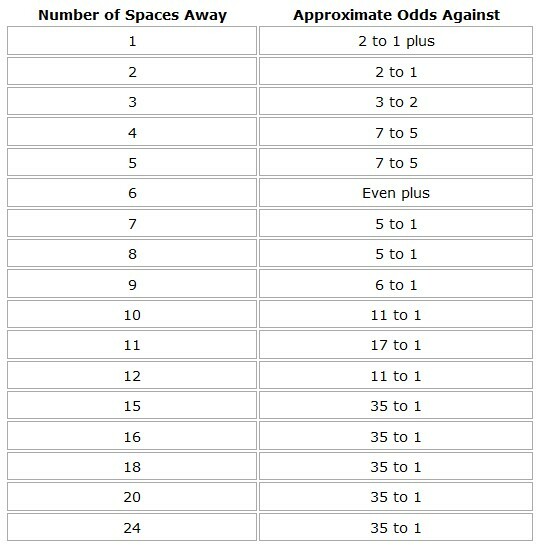 Here are the odds for rolling the proper combinations for bringing your man off the bar and back into the game. Finally, keep in mind that in all games of chance the "feel" of the dice must be considered. If you have ever shot crap, recall how often you have feit either your number or a seven coming up. It Stands to reason that improving your skill in backgammon will also improve your chance of winning. If you become serious at the game and play enough, your skill will come out ahead of your luck in the long run. To play and win at backgammon you must understand probability (i.e. the likelihood that a given event will occur). This is the principle on which much business activity is based. Insurance companies work on the probability of an event occurring, not on luck. So too with backgammon. If you put your trust in that fickle mistress, 'luck', she will let you down. Luck is of importance at any given moment. The novice can defeat the expert for one game if he has enough 'lucky' dice. Everyone has the odd lucky throw, getting the one combination that can save the situation. At rubber bridge the novice, by holding all the big cards, can win a game, but over a series of games the luck of the deal in cards, or the dice in backgammon, evens out, and the skill of the expert bridge or backgammon player will show. Even when luck is an important factor, you still need skill to make proper use of it. Probability is a science which, when correctly used in backgammon, is of the greatest help. Probability determines the odds of an event occurring, and you must be able to select the right move so that the probabilities of covering a blot, or the odds of being hit are as much in your favour as possible. There are 6 numbers on a die, and if you throw that die 6 times the probability of getting each individual number to turn up is 1 in 65. If however you throw it 1000 times the law of large will apply and each number will turn up more or less the same number of turns. You may win one or two games by relying on lucky dice, but play 1000 games and you will only come out on top if you play to the laws of probability. 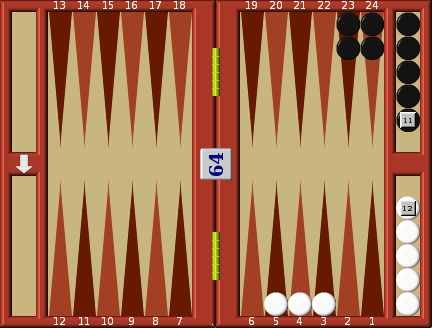 In backgammon each die can be thrown 6 ways, which when multiplied together produces 36 possibilities. 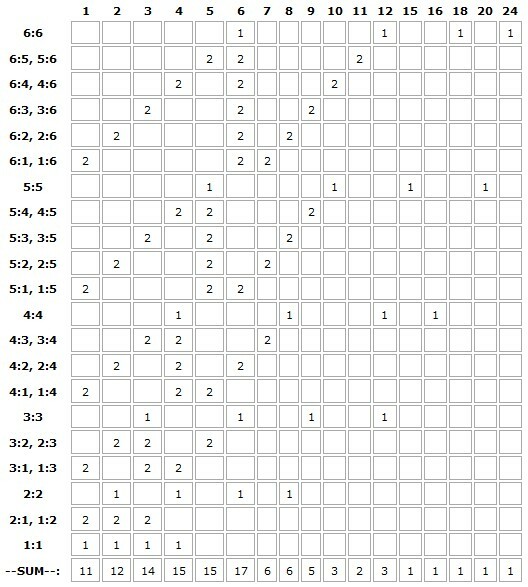 Imagine that you have two dice; the following table shows all possible 36 permutations into which the dice can fall. That the probability of a specific double turning up is 1 in 36. That all non-double permutations turn up twice in 36, i.e. 1:6, 6:1. That the probability of any one specific number turning up on either die is 11 in 36, i.e. there are 11 permutations that produce the number 1. Although there are 36 permutations of the dice, there are only 21 combinations; 6:5 and 5:6, though different permutations of the dice, bring the man moved to the same destination. Do not make the mistake of thinking that because you have not thrown a specific number (such as a 6) for the last 10 turns, that the probability of throwing a 6 in the next few turns has increased. The dice are inanimate and have no memory. The chances of throwing a 6 always remain the same, 11 in 36, regardless of whether you have thrown a 6 ten times in a row, or if you have not had a 6 for the last ten turns. The most dangerous place to leave a blot is exactly 6 points away from your opponent. His chances of hitting you are 17 in 36. If you must expose a blot, try and expose it to an indirect shot (i.e. a number requiring the combined total of both dice to hit it). The further away you expose a blot the better the chances of survival. If your blot is exposed to a direct shot (i.e. a number that is less than seven) place it as close to your opponent as possible. The chances of being hit become less as you get closer. In diagram you will see a figure printed at the top of each point. These figures show the number of your opponent's dice combinations that can hit a white blot exposed on each point. You can quickly see taht the 3 safest points on which to leave an opening move blot are 11, 10 and 9. 19 chances in 36 that he can hit you, but is forced to leave a blot. 12 chances in 36 that he will miss your blot. If he misses you (12 in 36) you will have 17 chances in 36 to cover your blot from 1 on your next turn, and make your opponent's important bar point. If he hits you and leaves a blot (19 in 36) only 6:6 will stop you re-entering your man (1 in 36), as his board is wide open. You will then have two separated men in his inner board, giving you 22 chances in 36 of hitting his blot on 7 with the second die. Although your blot was hit, and had to go backwards some 4 or 5 points, his blot, when hit, has to go back nearly 20 points to re-enter your home board, or over 2 average rolls of the dice. 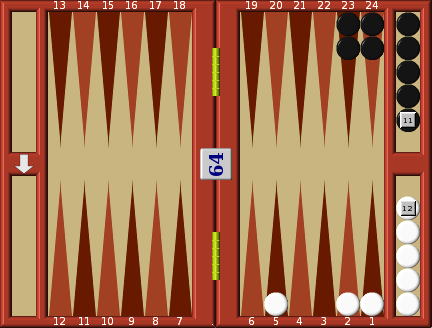 Many games of backgammon are won by only one or two throws of the dice, so this is a major reverse for your opponent. Only 5 times in 36 will he hit and cover his blot to make the bar point and your sacrifice will have been in vain. With all the 31 other permutations, the reward of hitting his blot, or of making his bar point justify the risk taken. This sacrifice move into 7 is particularly attractive if you have three men separated in the opponent's home board. You would not do this move if your opponent has made points in his inner board; you would only do this as long as re-entry is easy, and should never risk it if re-entry chances are reduced. Much the same argument applies to 5, another of his vital points, and therefore a good one on which to play an opening move. Here is a situation where you have one man on the bar, and your opponent has 3 closed points and three open points. At first sight you might naturally think that the chances of re-entry are 50-50. In actual fact they are far better. Only 9 throws will stop re-entry (3:3, 4:4, 6:6, 6:3, 3:6, 6:4, 4:6, 4:3, 3:4). With the remaining 27 throws you will be able to re-enter your man, making the odds 3 to 1 or 75%. Equally if you have two men on the bar your chances of re-entry will fall dramatically to a meagre 25%. You must grasp clearly these probabilities of re-entry. Once your opponent starts to close up his board you must take great care never to give him the opportunity to get two of your men on the bar, and conversely it is worth paying almost any price to get two of his men on the bar. In diagram White throws a 6:1. He removes the man on 5 with the 6; but what is he to do with the 1? He can either move 4-3, to place men on 3, or he can move 3-2. Which is correct? You will see that two men on 3 have a 47% chance of being removed with the next throw of the dice, but if the two men are split 4-2 the chances rise to 64%. In diagram White throws 2:1. He has three choices in front of him. Remove the man on 1, and move 5-3, leaving a man on the 2 and a man on 3. Remove a man on 2 and move 5-4, leaving a man on 4 and the other on 1. Remove 2 men from the 2 and 1 points, leaving one man on 5. Which is correct? You will find that if he does No. 1 (3-2) he has a 69% chance of getting off in one throw. With No. 2 (4-1) an 81% chance. With No. 3, an 86% chance. Leave one man on a higher point, rather than 2 split men on lower points. If you have two men left, and a move to make within your home board, move the lower man further down, rather than moving the higher one down. Try and avoid leaving two men on the same point. If you have a choice keep them separate. Common sense would seem to indicate that if an opponent is in a position to double you, then conversely you must be in a position where you must refuse the double. This is not correct; there are many situations where it is both right to double, and right to accept. He still loses over the 100 games, but by accepting the double he reduces his loss from 100€ to only 56€. The break-even point for accepting the double is 75% to Black, 25% to White. If the odds are worse than this White is better off refusing. If better than 75/25, White will lose less by accepting.